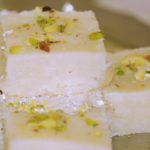 Almond cream sweets: barfi badam: Many years ago I had the experience of working with an Indian doctor and her family. 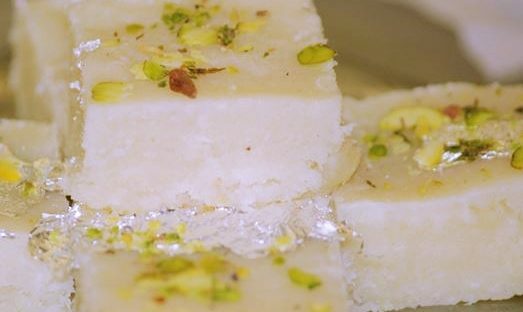 She regularly made ‘Barfi Badam’ for her mother and occasionally would allow the children to have some. They are absolutely delicious! If this is your first time attempting this recipe and you have never had these almond cream sweets before, rest assured that your time will not be wasted. Place the milk in a large, heavy-based saucepan. Bring to a boil over fairly high heat and continue cooking, stirring constantly until significantly reduced and very thick in texture. Stir in the sugar and continue cooking for 10 minutes over low heat. At this point stir in the nuts then continue cooking, stirring constantly, until the mixture thickens and begins to come away from the base and sides of the pan, coming together into a single mass. Take off the heat at this point then sprinkle the cardamom over the top then mix thoroughly to combine. Turn out onto a greased plate then smooth the top with the back of a buttered spoon. Allow to cool slightly then mark a diamond shape in the surface. 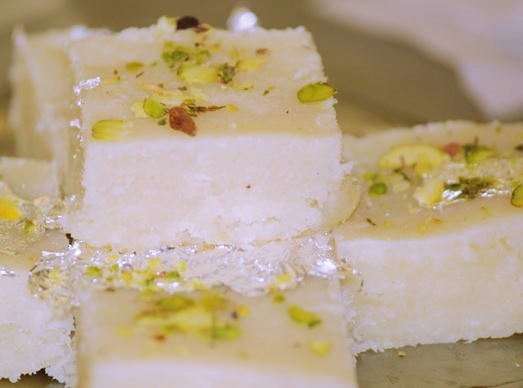 Decorate with slivered almonds, pistachio nut halves and, if desired, silver or gold leaf. Just before the barfi bedam is completely firm use a sharp knife to cut along the diamond markings. Set aside to cool completely then separate into pieces. Store in an air-tight tin.